As we have noted previously, the second most important anthropogenic greenhouse gas (after carbon dioxide, or CO2), is methane (CH4), and although its concentration (only about 1.8 ppm) is far less than that of CO2 (at 390 ppm), it’s a stronger greenhouse gas on a per-molecule basis, and it ends up transformed into CO2 by atmospheric chemistry processes anyway. 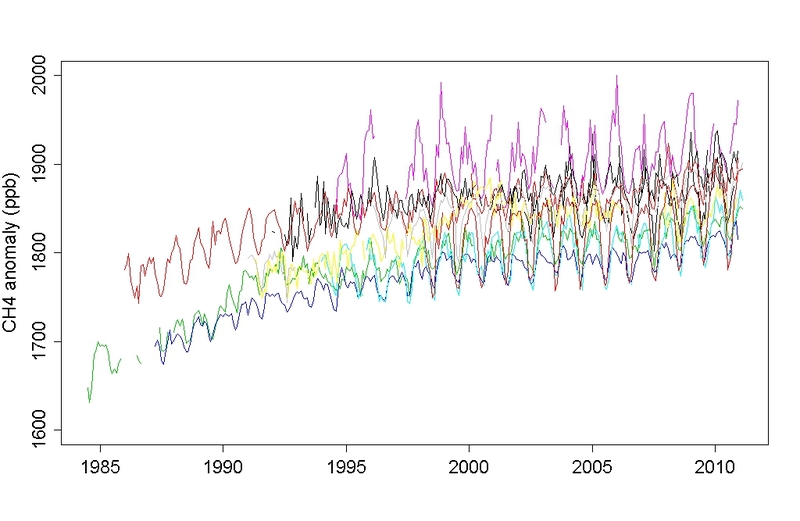 Also, more than half the atmospheric CH4 load is due to changes wrought by mankind. 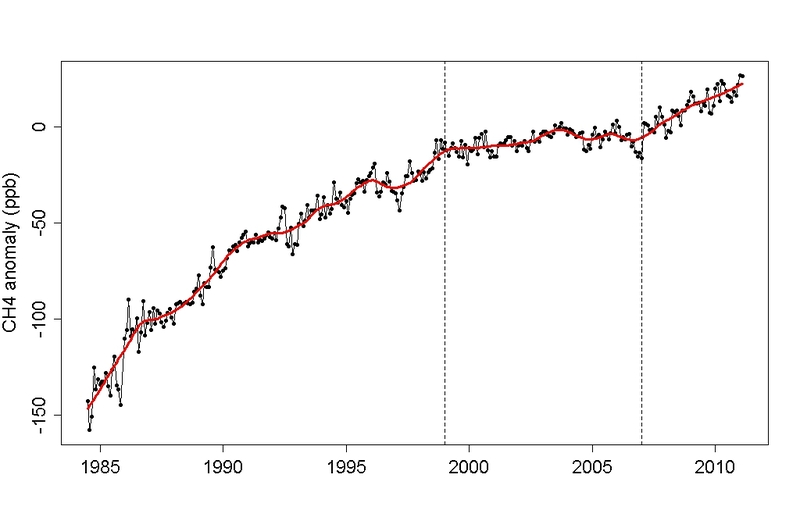 Atmospheric methane concentration had stabilized from about 1999 to 2007, but recently began rising again, as reported in Rigby et al (2008). There’s a clear offset between different stations. 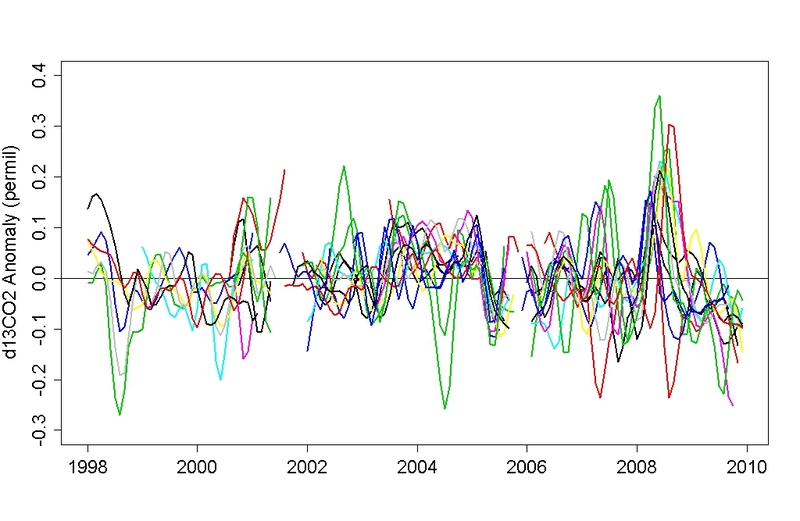 Also, some have noisier data than others, they have different annual cycles (some larger, some smaller), so the bare “spaghetti graph” isn’t very enlightening, especially about the last few years. We can combine data from different stations, but we’ll have to compensate for the fact that different locations have values which are offset from each other. Basically, we need to combine the data records by aligning them to a common average value over their period of overlap. This is the same process done with temperature data to align different records. Incidentally, I’ve recently abandoned my own method of aligning data records in favor of a modified form of the Berkeley method. There’s clear indication that the increase, which began about 2007, is still under way. 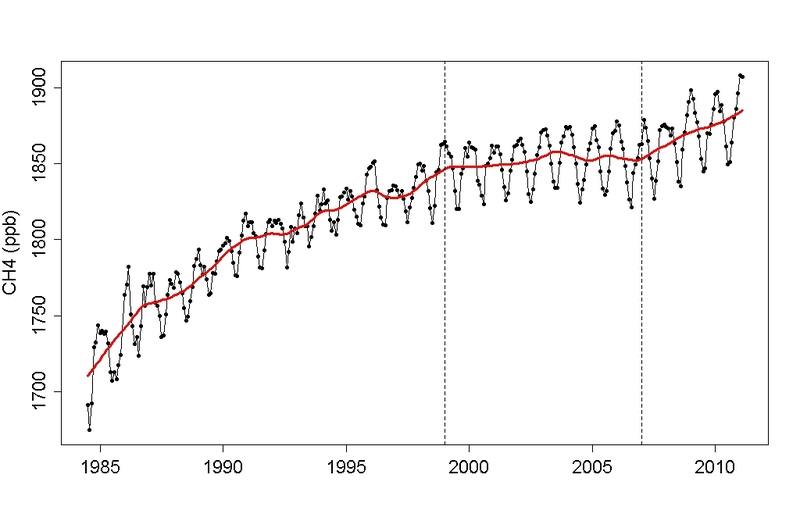 It appears that atmospheric CH4 concentration is increasing at a rate of 5.9 +/- 1.6 ppb/yr. What does it mean? I don’t know. Thanks for the analysis. You left out the very last and trivial step, which is working that out in percent (about 0.3% I think) and comparing that to other stuff (Co2 is about 0.5% if I recall rightly). I second the thank you for the analysis. I knew that there had been two years of increase in a row, but hadn’t looked for a while, and hadn’t seen any analysis quite this clean. Looking at the graph, the trend from 1985 will about the same. To put this into the context of the SRES scenarios used in the IPCC TAR and AR4 reports, methane concentrations are projected to reach 1900 to 2600 ppb by 2050 (all but one are 2300 or more). Since concentrations were about 1850 ppb back in 2000, to reach 2300 ppb by 2050 translates to an average increase of about 9 ppb/year. Thanks very much for following this. Very nice work – even more interesting would be if we could also have some way to estimate how much of the methane is coming from the warming of permafrost and deep-sea sediments – which is probably the biggest danger laying just ahead of us! Shouldn’t the first two graphs have “CH4” on their Y-axis instead of “CH4 anomaly”? 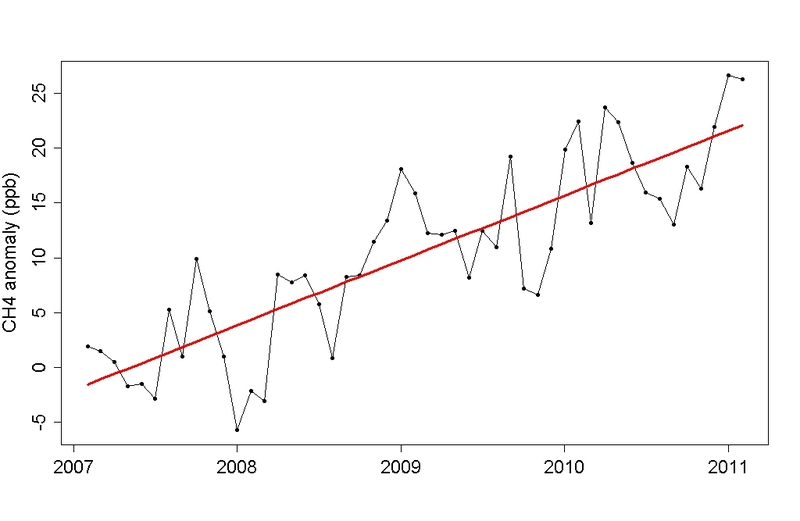 It would be interesting to know whether the d13 ratio for atmospheric methane is changing. 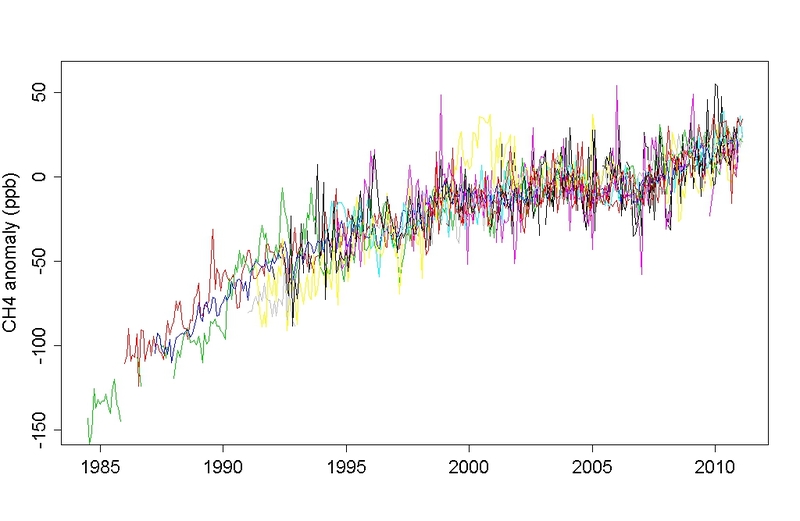 Ie it methane increase for normal sources or are we starting to see a contribution from hydrates? By request, I retrieved data for d13CH4. It’s shown in the UPDATE to the post. Thanks tamino. I’d say those results would be consistent with “maybe” at best. 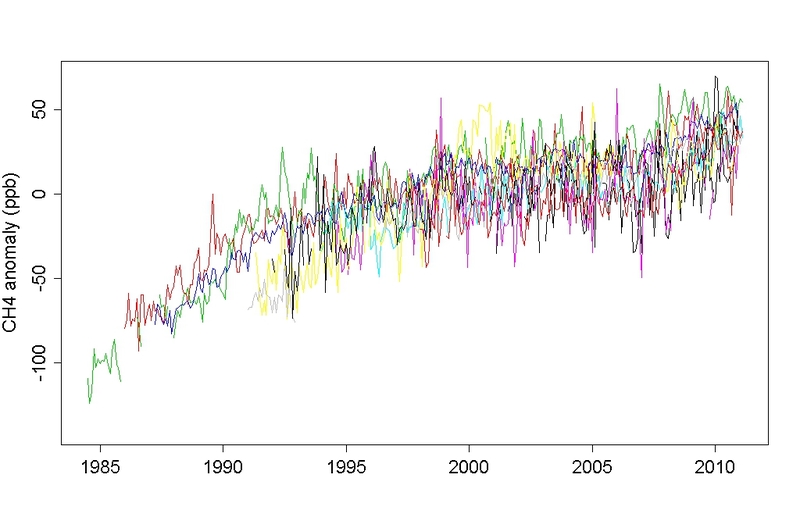 The variability is very high and I would guess ocean plankton blooms to be dominant cause of those seesaws, Way too early for a negative trend to be apparent. Hasn’t there been a lot news about methane leakage from shale-gas drilling? What is the expected half life of methane in the atmosphere? I assume that knowledge of the steady state kinetics of methane conversion to CO2 could be used to determine the actual rates of new methane emission. EPA has the lifetime at 12 years, but I’ve also seen it at around 10 and Wikipedia has a net lifetime at 8.4 years. A note about the “Berkeley method.” Wouldn’t this be an especially good way to combine the radiosonde measurements, what with their many breakpoints? So it’s not the clathrates or at least not mainly it at all. Methane released into cold, pressurized water dissolves and is candy for microbes, as occurred in the BP oil gusher in the Gulf of Mexico. Clathrate decomposition is a likely source of methane as the seas warm. However, clathrate decomposition is a very non-linear process. The first hints that it is occurring is likely to be very brief and very local pulses of methane. At first these pulses will look like noise and bad data. And as long as I am out here spouting unsupported nonsense, I suggest the plumes of methane that have been noted in the Arctic seas, have affected patterns of sea ice melt. (Which curve also kinked upwards in 2007.) My point is that clathrates decompose at a temperature that is only somewhat above the melting point of ice and we are seeing a lot of ice melt. If the ice is melting, what is going to keep the clathrates cold? 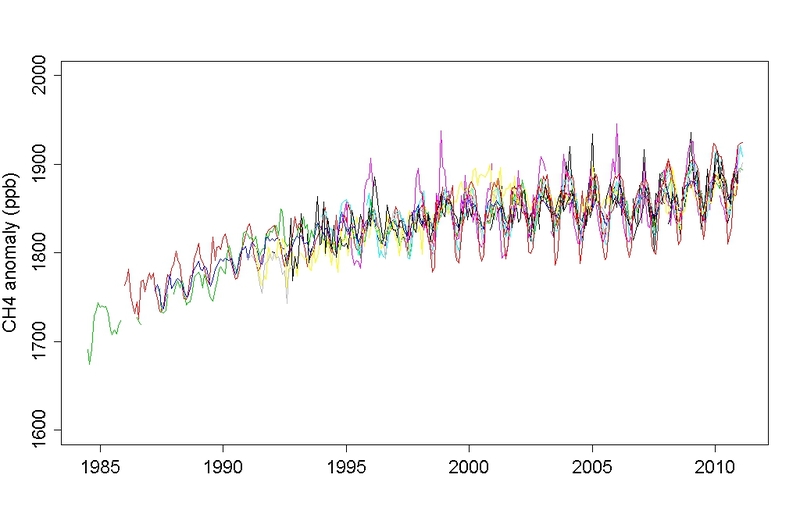 If I did not see some sharp local pulses of methane, I would think that my data was “bad”. And, I suggest that sea ice melt speeds release of methane from the water column where it degrades more rapidly, into the atmosphere where it degrades more slowly. Hi! Can you convince me that we should be paying more attention to marine clathrates than to terrestrial permafrost? Could thawing permafrost be a simpler explanation? My understanding is that most clathrates aren’t simply held in place by temps: they’re also buried deep in the vegetative muck they’re derived from. The pressure of the material above them helps to change the temperature needed to release them. By the time that temps change enough to release clathrates, their big methane burp would be the coup de grace to put us out of our misery rather than one of the events which powered our decline. [Brightly] Seen that way, clathrates are our friends! Oh, boy, something to look forward to. Seriously, thanks for the careful work and a couple of commenters’ links: ESRL and Science Gulf of Mexico methane report. 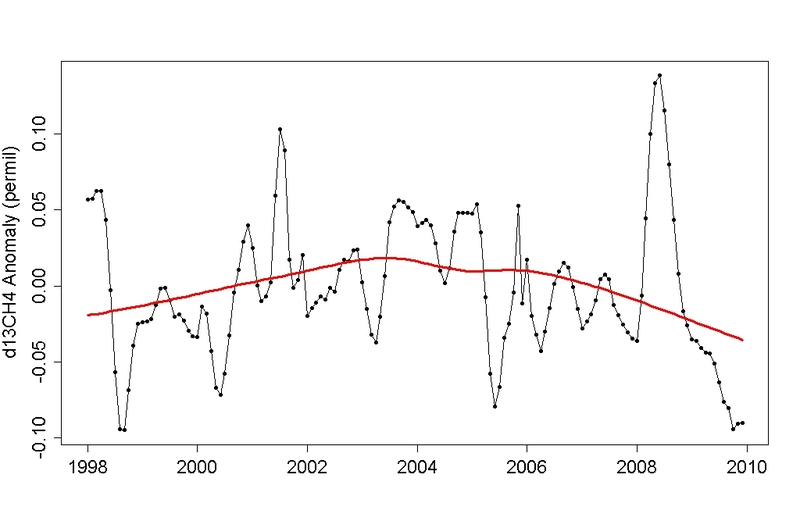 The big spike in d13 in 2008 is puzzling. What I find really worrying though is that when I put in the term “Greenland Temperature Trend” the whole first page of Google results is denialist. propaganda. Ah, yes, basically a minor extension of the “it was cold in my backyard yesterday” cherry-pick–Nuuk in April not being significantly better as a indicator than any random backyard on any random day. Unfortunately, the prevalence of denialist propaganda definitely does mean something–though just what remains to be seen, I suppose. The lifetime question has been well answered but, if Eli may blogwhore a bit, here is an article on how methane degrades in the atmosphere, and here is one on the oxidative capacity (the ability of the atmosphere to degrade methane and everything else). Good news, the oxidative capacity is not declining. Chuckle; co2science shows up only among the “very similar” — at least Google is noticing the copypaste stuff. Tamino’s topic also shows up as of today on the first page. There are two common lifetimes for CH4 reported: the “residence time” (eg, how likely a given molecule emitted is to still be around), and the “adjustment time” (eg, how long it takes for atmospheric concentrations to relax). The policy relevant lifetime is the adjustment time. For most substances, residence time and adjustment time are almost identical. This is not quite true for methane, however, because methane emissions use up the OH sink, making all methane live longer. So the residence time is about 9 years, and the adjustment time is about 12 years. (its even worse for CO2;, with a residence time of about 5 years, and a poorly defined adjustment time, extending to hundreds or thousands of years but not as a single exponential). The problem is that the models say that warm water moving into the Arctic from the Atlantic should be decomposing sea bed clathrates, we are starting to see plumes of methane in the Arctic, and we are starting to see (downwind) spikes in atmospheric methane. This is in addition to thawing permafrost, not instead of it. It makes thawing permafrost more interesting. The problem with much of this speculation is that HO (Eli’s air pollution modeller friend says it has to be HO rather than OH according to IUPAC, but Eli is a chemical kineticist and it is OH) has remained constant. Much more so than the temperature. Most likely the differences in adjustment time are due to different air pollution models. In these things the newest figure is probably the best as it will have a newer and shinier reaction mechanism. Thanks Agres, always nice to be able to click on cited info. The lead authors of the Gulf methane degradation critique mentioned above (Joye and Leifer) are leading separate NSF-funded obs campaign focused on the East Siberian Shelf clathrates. This recent slide presentation (also the abstract) by Shakhova and Semilitov incorporates some of the early results from the Leifer team, and is pretty scary reading. If my calculation is correct, their estimated 3.5 Gt of methane releases is about 100 ppm CO2-eq. annually (although that leads to the question of where it is since it doesn’t seem to be showing up in the global figures yet). A recent paper finds that large releases of methane will have a much longer residence time (and so warming effect) due to basically overwhelming the chemical processes that break it down. Folks may recall the argument of the “trillion tonne” proponents that the shape of the emissions curve makes little difference. This paper seems to indicate otherwise. I notice that the recent Schaefer et al. paper on permafrost carbon emissions continues to be misinterpreted as saying that the tipping point isn’t for about 15 more years. What it actually says is that the loss is already committed to by the warming to date, and that the permafrost will cross over from being a sink to a source in 15 years. Their follow-up study, now underway, will take into account feedbacks and the fact that some of the emissions will be methane (the first paper assumed all-CO2). My amateur guess is that the second paper will find permafrost emissions of about 100 ppm CO2-eq. by 2100; the first one found about half that. At this point I’m finding it quite hard to imagine how the ESS clathrates can be stopped from undergoing a major release that gets us into the +5C range in a hurry. This was great reading. I presume the blogster is removing the posts by the deniers. I am so tired of them hijacking forums. My understanding of the impact of Methane is that it has an immediate CO2 equivalency impact of 100 times. As I understand it, the figure of 25 times CO2 impact comes from calculating the impact of a CHE molecule compared to a CO2 molecule over a period of 100 years. In that calculation, the shorter life of CH4 in the atmosphere reduces its calculated impact over 100 years to 25. However, when we look at the atmospheric levels of methane and try to understand what that means on the impact of global warming, it seems to me that we need to use the factor of 100. The added molecules of methane are having a impact right now as if they were 100 CO2 molecules. Looking at it that way, the 1.2 ppm increase of methane in the past 200 years acts like an increase of 120 ppm increase of CO2. If this is correct, the reports by Simelitov concerning the kilometer wide CH4 plumes in the Siberian Sea are frightening. It would imply that global warming will be happening much faster and more extreme than now reported.